Note that if the path contains spaces, the string must be enclosed in quotation marks (this applies both to the program name and to the .ini file). This technique can also be used to create a desktop shortcut. Create a shortcut on the desktop in the usual fashion, then right-click on the icon and select "Properties" from the local menu. Edit the "Target" edit control to add a space, "/i", and the name of the desired .ini file. The resulting string would look similar to the example above. Key point: although the filename alone will work if the .ini file is local, it is safer to use the full pathname. To assure that you are specifying the correct file, use the full pathname. To display a user's Kelly days in an alternate color, create a "phantom" platoon with the desired foreground and inverse colors, then replace the platoon entry in ShiftRotation with the "phantom" platoon identifier. For the following example, we will assume that the user works a 24-on, 48-off rotation with a Kelly day every seventh shift, and that the user is assigned to the "C" platoon. Notice that the last "C" shift entry has been changed to a "D". Save the changes to the .ini file and reload it (e.g. with File | Ini File). We have had several agencies that use "gold" as one of their platoon colors comment that "yellow" is a poor substitute, especially on printed output. The list of named colors in Windows is fairly limited, so we have added the ability to use RGB color saturation to specify platoon colors. The color string begins with a dollar sign (to denote hexadecimal), then includes the color saturation values for red, green, and blue in hexadecimal (e.g. $RRGGBB). Two popular RGB representations of gold are $DAA520 and $FFD700. There are many excellent sites on the web that list RGB values for common colors; we suggest performing a search on the keywords RGB, hexadecimal, and color. 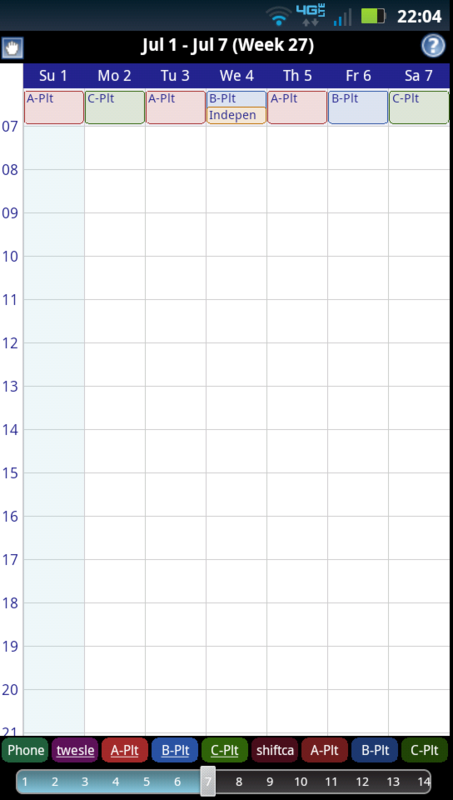 When a message is too long to fit into the current date grid square, the message is truncated and an ellipsis (...) is displayed. Every time I print a calendar, I have to change the title so it doesn't print "Erickson Enterprises". How can I permanently set my preferred title? - Type your preferred title into the "Title" edit control and click on "Ok"
Note that additional edit controls are provided when the "Wallet" tab is selected. These may be used to enter additional information to appear at the top of "portrait" mode wallet calendars, which result when printing to business card stock in "landscape" mode. Page margins (as well as paper size and orientation) can be set using the File | Page Setup option. If any of the user-specified margins are smaller than the printer's unprintable region, the margin(s) will be resized to the minimum size supported by the active printer. If calendars do not print at the same relative location on each business card on a page (e.g. the printed calendars "creep" up or down the page), the offset between cards can be modified by setting a value for BC Offset in the "Offsets" dialog accessed from the Wallet "Print Options" page. Most modern printers are quite accurate in the placement of objects on the printed page. Nevertheless, the inkjet printer we most often use for wallet calendars requires a BCOffset of 3 for optimum results. If wallet calendars start printing too high or too low on your particular combination of printer and business card stock, the entire printout can be moved up or down on the printed page . Positive numbers move the printout down the page or to the right, while negative numbers move the printout up the page or to the left. The offset is measured in the printer's native resolution in pixels. For example, a value of 30 will move the printed output one-tenth inch on a printer with a native resolution of 300 dpi. No entries were made for WalPortLeft or WalLandTop, since the printer places these edges accurately. 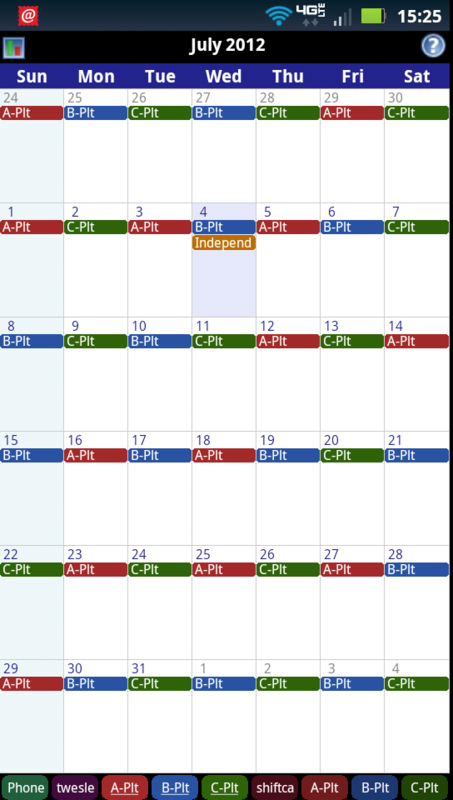 Users with a GMail account can use the SC2iCal utility to generate iCalendar (.ics) or comma-separated value (.csv) files which can be imported into Google Calendar. 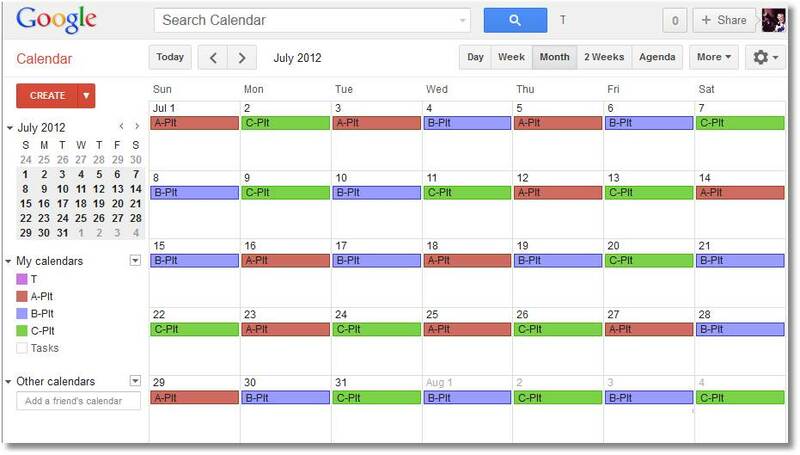 Click here to see an example of shift information displayed in Google Calendar. Users of Android phones enjoy the benefits of auto-synchronization with their Google Mail and Google Calendar accounts. 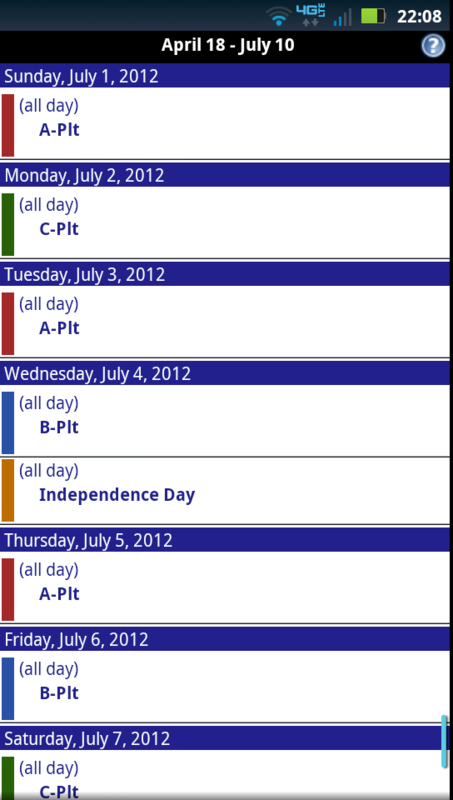 Click to see a monthly, weekly, or an agenda display in the Android Calendar application.